In May 2018, just earlier this year, Kilauea exploded. This violent activity shook Hawaii Volcanoes National Park, causing the park to close due to earthquakes, toxic ash, and unpredictable lava flows. The lava from the molten lake in Halemaumau Crater subsided, then disappeared entirely as cracks in the ground appeared in the Leilani Estates area, east of the park. Soon, these large cracks opened wider and started spewing lava into the area, creating a giant fissure and new lava flows. The new eruptions in what is now called the East Rift Zone closed off parts of the Puna area, causing local residents to be evacuated while some of their homes were destroyed by the impending lava flow. During this time, earthquakes continued to shake Hawaii Volcanoes National Park, disrupting park infrastructure and changing the landscape itself. In June, Halemaumau Crater collapsed, creating a much larger sunken crater in the area. 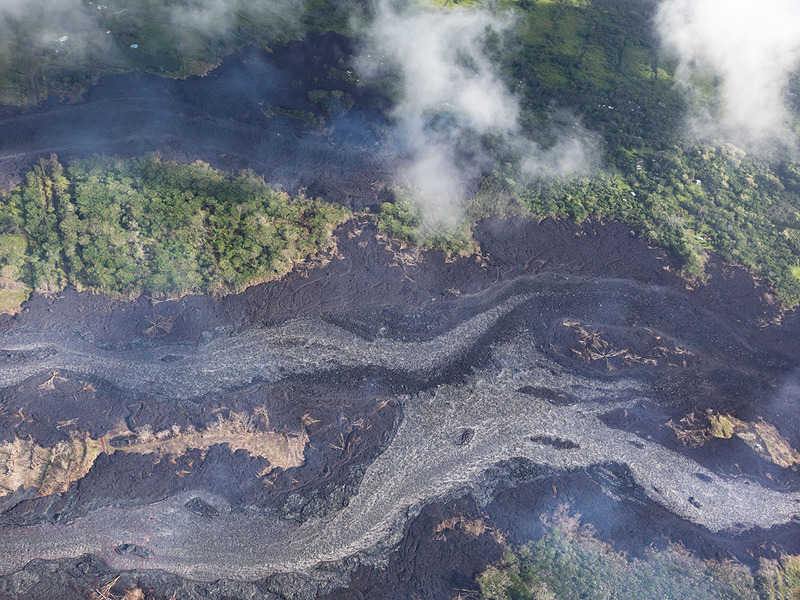 Beginning in early August, the lava flows and seismic activity in the area subsided considerably, allowing authorities to assess the damage and create a plan to rebuild. Efforts began soon, and parts of Volcanoes National Park reopened to the public on September 22, 2018. Recovery efforts are ongoing, and the park is slowly becoming more accessible to the public in its new, post-fissure form. What’s different with the volcano? 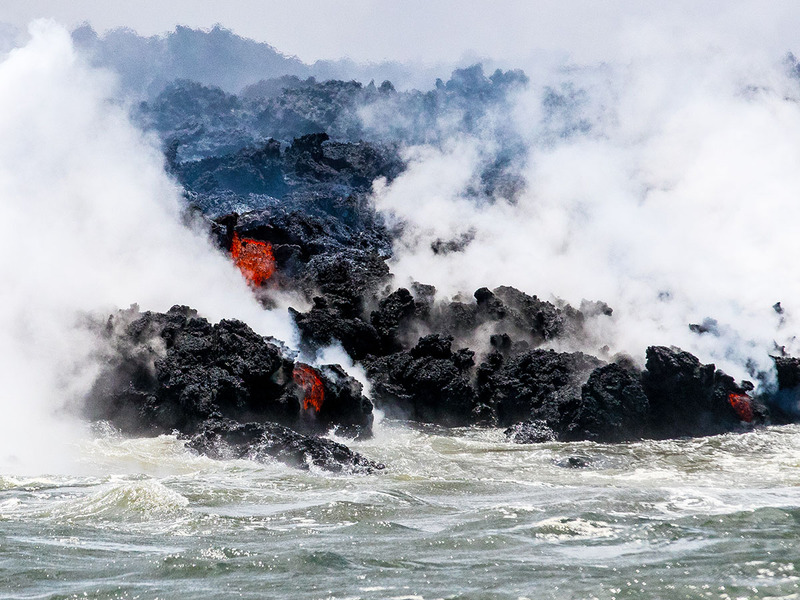 The most notable difference for newcomers is that as of October 2018, lava is no longer flowing. For those of you who had visited the park before, you might be shocked to see how large Halemaumau Crater has gotten. During the East Rift Zone eruptions, the lava lake in the crater drained, and earthquakes caused multiple collapses that have made the caldera widen over the course of months. 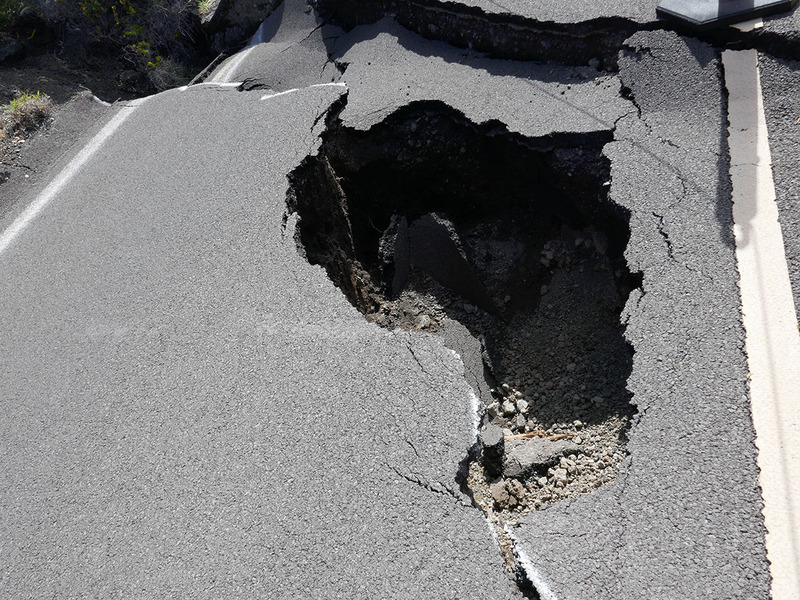 Damage to the park and its structures has left the Thurston Lava Tube closed, as well as most trails and roads that go past the operating areas. These land-based sightseeing tours take you into Hawaii Volcanoes National Park to see firsthand and up-close the power of a volcano. This small-group tour fits up to 12 people on a guided sightseeing adventure from Kona to Hilo. Visit local ranches, the famous Waipio Valley, beautiful waterfalls, and Volcanoes National Park. This tour focuses on the Hilo side of the Big Island, taking you through Hawaii Volcanoes National Park to see the biggest attractions there before heading north to Hilo, where you’ll visit the spectacular Rainbow Falls and a black sand beach. This luxury sightseeing tour visits a Kona coffee farm and a black sand beach before going to the newly-reopened Volcanoes National Park. You’ll then see the beautiful waterfalls of Hilo before heading back to your hotel. This tour starts in the afternoon, at which time you’ll visit a lava tube right outside Hilo before seeing the most recent lava flows in the Lower East Rift Zone, then tour Volcanoes National Park before going stargazing at night time. 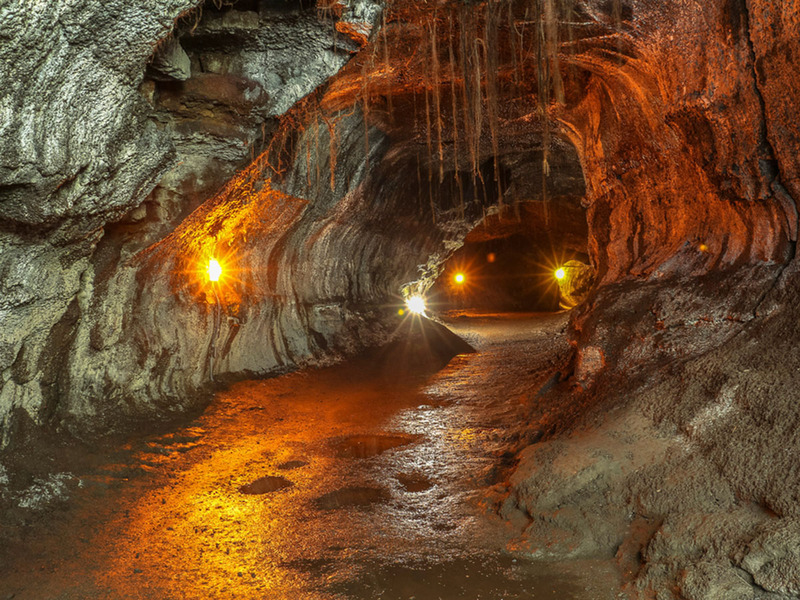 This unique tour gives you the chance to visit a private lava tube with golden microbial mats accenting the cave walls. 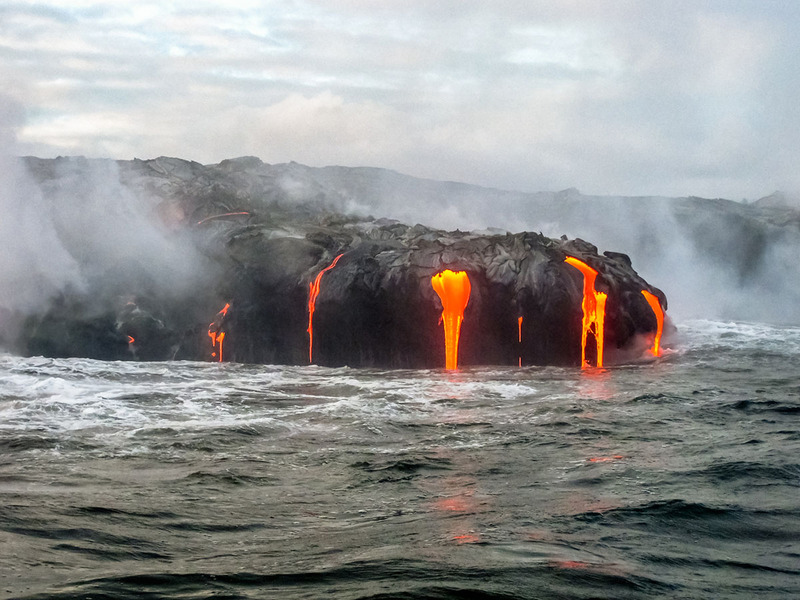 It also visits Hawaii Volcanoes National park for a short hike with a certified guide. Visit a Kona coffee farm, a black sand beach, and a lava tube before heading to Hawaii Volcanoes National Park. Explore the park attractions, new and old, while they’re open before enjoying a delicious sit-down dinner. Later, you’ll go stargazing at Mauna Kea before returning home. This private tour takes place in a van or SUV for an intimate guided experience. 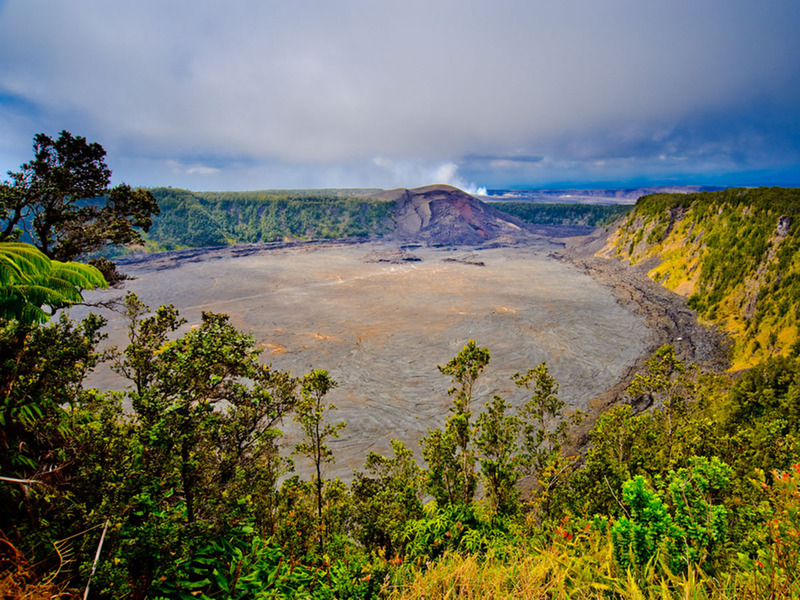 Lasting 6 hours with your own private guide, this is an excellent tour for families or groups of friends who are visiting the Big Island for the first time and want to see and learn all they can about the United States’ only active volcano. Lava from the fissure flowing into the ocean where it has created 555 new acres of land on the Big Island. For those staying on Oahu, this one-day fly-away tour takes you to the Big Island for a single day of adventure! With airfare and transportation included, this is the perfect option for those who want to see the volcano, but don’t want to stay on the Big Island. Not only does the tour include a ground-based sightseeing tour that takes you into Hawaii Volcanoes National Park, you’ll also get to experience a helicopter tour over the Big Island to get a bird’s eye view! The volcano is the Big Island of Hawaii’s biggest attraction, but it’s far from the only reason to visit! Check out more volcano tours and tours on the Big Island on our website, HawaiiActivities.com!